An island of paradise for those who seek a serene getaway. What to do there? From trekking, hiking, snorkeling, camping to taking a dip into the waterfalls of Lombok, there are plenty of outdoor activities that will surely excite you here. This mesmerizing island located in West Nusa Tenggara province is a must place to visit if you ever step your foot in Southeast Asia. It has recently became one of the top holiday destinations and a famous stopover for travellers from Bali island as it is located nearby. Take a short hike for 10 minutes to enjoy an elevated view of Lombok during sunset at Merese Hill in Tanjung Aan. The top of Merese Hill or the viewpoint stands nothing against the sunset so you will get to see a vast view of the stunning ocean landscape. If you are up for an extreme adventure, witness the whole island by trekking to the summit of volcanic mountain famed to Lombok - Mount Rinjani. It is only recommended for fit hikers due to the challenging hike up to Mount Rinjani as it requires a climb of 1500m high along an 8 km trail. Experience underwater activities like snorkeling and diving at Lombok most famous triplet islands, Gili Trawangan, Gili Meno and Gili Air. Located next to each other, the Gilis are well known due to the beauty of the crystal clear water and famous for scuba diving. Here in these islands, you can definitely go crazy and join the nightlife scene if you are keen. Additionally, opt for camping with your group of friends at the quietest island in Lombok - Kenawa Island. Aside from being less crowded, the calm and peaceful surrounding at this island will make you feel like you almost own the area all to yourself! Learn more about culture and the people in Lombok by visiting Tetebatu Village. Here, you can witness local handicrafts being made by the local villagers and also spend some time to shop for gifts to bring home. While you are here, you can also enjoy some food hunting for local food around Lombok and try famous dishes like Nasi Balap, Sate Bulayak, Ayam Taliwang and Plecing Kangkung. What to see there? For sightseeing, Lombok offers untouched views of nature and dreamy scenery to all its visitors. Start your trip with Pantai Tangsi or also known as the Pink Beach. What's so unique about this beach is it is one of seven beaches in the world with pink sands! Another must-visit beach here in Lombok is Tanjung Aan, where you can enjoy a Carribean-like scenery of this beautiful beach while taking a dip in its pristine waters. 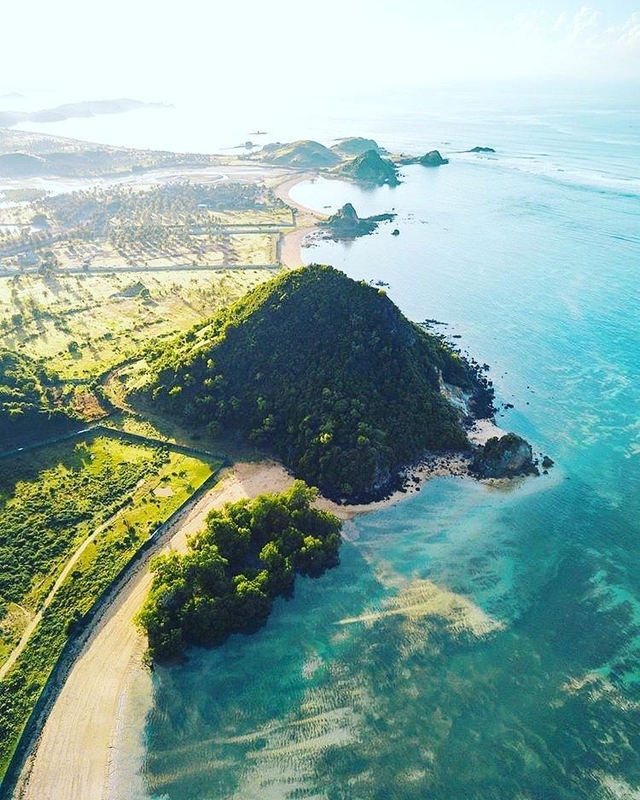 You can also find other beautiful beaches in Lombok like Selong Belanak Beach, Pandanan Beach, Sire Beach and Mawun Beach which are less visited by tourists. Enjoy the peaceful view and take plenty of photos here too as it is one of the top attractions in Lombok. You can also visit another top attraction in Lombok, Lake Segara Anak to see the volcanic lake spanning over 11 km wide. You can also go for camping and fishing at this lake if you are interested too. Or, head 10 km east of Lombok to visit the Narmada Park or Narmada Water Palace. This huge complex comes with a beautiful park, lake and green surrounding which makes a good place for morning walks. It would be wrong to visit Lombok without checking out the stunning waterfalls here. Lombok has some of the most popular tiered waterfalls known to Indonesia. Most travellers come here to visit the Tiu Kelep and Sendang Gile Waterfalls to see the magical views of this twin waterfall. You can also check out the Benang Stokel and Benang Kelambu Waterfalls and be amazed with the natural curtain-like waterfalls. There are also other alternative waterfalls worth discovering including Tiu Teja Waterfall and Jeruk Manis Waterfall. There are also cultural sights and attractions for travellers to visit in Lombok. Commonly, the religious sites that can be found in Lombok are Hindu temples. Some of the popular temples in Lombok that are worth visiting including Pura Lingsar, Pura Gunung Sari, Pura Suranadi, Pura Gunung Pengsong, Pura Meru and Pura Batu Bolong. If you wish to discover art, go local souvenir shopping or simply experience seeing the local lifestyle in Lombok, there are traditional villages where you can visit such as Banyumulek Village, Sukarare Village and Sasak Sade Village. Each has its own unique charm and surely, you will feel very welcomed here by the locals as long as you respect their traditions. How are you? - Apa kabar? How much is it? - Berapa harganya? Whenever you visit any temples in Lombok, please be wearing appropriate attire and long pants or cover yourself using the provided cloth or ‘Sarong’ as a sign of respect. Lombok is hot and humid, most of the time. There 2 seasons here which are dry and wet season. Dry season usually from May to September and the wet season is from October to April. So plan your trip wisely! Going around Lombok is relatively easy by renting a motorcycle. You can navigate your way to some of the nearby attractions and save up on taxi fare. If you wish to visit places that are far from your place of stay, it is highly recommended to charter a private vehicle with a driver who will also be your tour guide. The rent per day depends on which place you wish to visit and price starts from IDR 500,000. Some interesting souvenirs to bring home from Lombok including jewelleries such as variety of fine pearls which you can find in Sekarbela Village. To experience Lombok’s culture, check out the events happening there during your visit. See the locals catch seaworms during Bau Nyale Festival, a traditional Sasak community celebration held annually. Alternatively, a one-week long Senggigi Festival is also another special island event that you can join. Expect unspoilt nature, beautiful scenery and plenty of attractions and activities in Lombok — a paradise for travellers seeking for a pleasant holiday.